Is Post-Crisis/N-52 Deathstroke as fast as 616 Spider-Man? @jay_z94: I think you’re too lenient on bullet timing to be honest. There are 4 bullet timing showings there - Daredevil, the barrel of a gun thing, saving the girl and intercepting the bullets, and dodging the bullet being easy. The rest seem to be aim dodging, the shots being energy blasts (AIM guards, another instance calls them stun blasts as well) or calculating the trajectory of the bullets and avoiding them. But to be honest, I don’t think that means he has better reactions than Bruce. 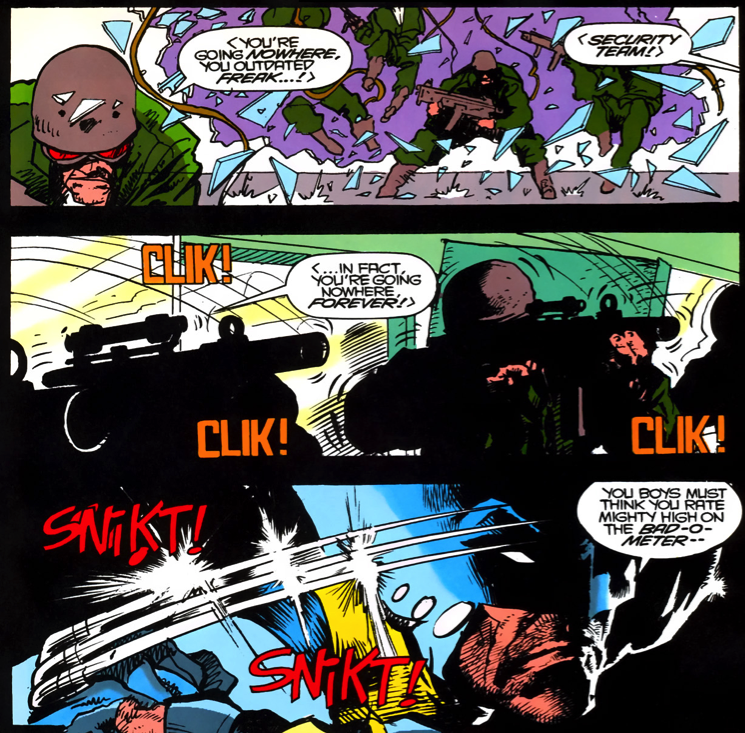 Batman has punched machine gun shots, evaded a surprise mach 3 sniper shot without looking (granted it was from a roof top and he was down on the street, so that makes the speed of the feat a bit more reasonable) as well as weaved himself over machine gunfire. That’s on par with Logan imo. Sure, your showings have Logan actually outpacing the gunfire (especially the barrel thing, I don’t see Bruce doing that ever) and intercepting it, but that’s more relevant to travel speed rather than reaction time. Like I’ve said, his combat and travel speed is much more impressive than his reactions. I’ll show the scans tommorow when I get the time. @jay_z94: I think you’re too lenient on bullet timing to be honest. There are 4 bullet timing showings there - Daredevil, the barrel of a gun thing, saving the girl and intercepting the bullets, and dodging the bullet being easy. 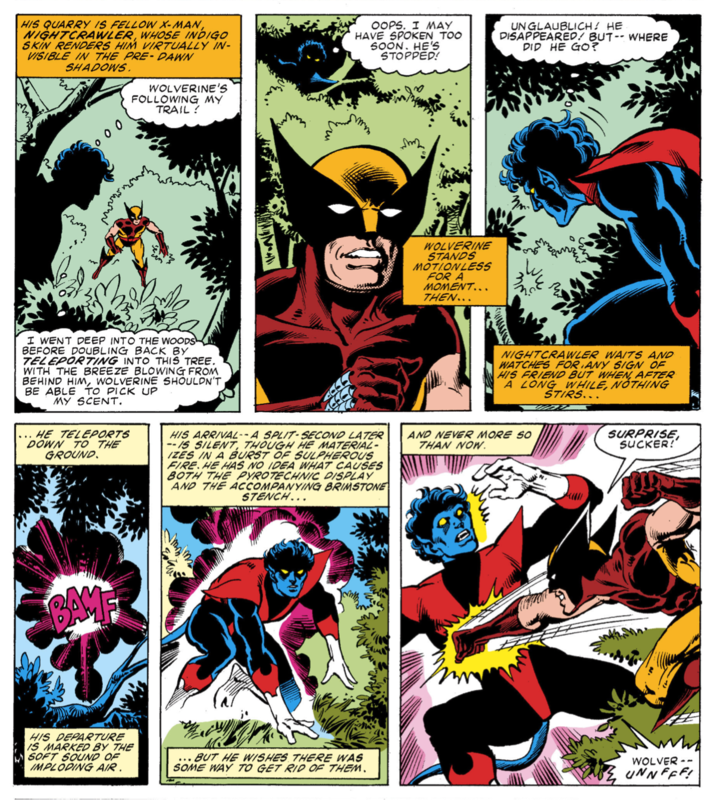 So Wolverine does have multiple bullet timing feats. Tbh I could probably find some more if I looked hard enough. The rest seem to be aim dodging, the shots being energy blasts (AIM guards, another instance calls them stun blasts as well) or calculating the trajectory of the bullets and avoiding them. They are bullets being fired from machine guns. It only looks like energy to show the trajectory. Calculating the trajectory of bullets that are in mid-air and angling a panel is still bullet timing. But to be honest, I don’t think that means he has better reactions than Bruce. Batman has punched machine gun shots, evaded a surprise mach 3 sniper shot without looking (granted it was from a roof top and he was down on the street, so that makes the speed of the feat a bit more reasonable) as well as weaved himself over machine gunfire. That’s on par with Logan imo. Yeah I agree that's on par with Logan, but it still doesn't prove that Bruce has better reactions like the other poster was saying. Sure, your showings have Logan actually outpacing the gunfire (especially the barrel thing, I don’t see Bruce doing that ever) and intercepting it, but that’s more relevant to travel speed rather than reaction time. Like I’ve said, his combat and travel speed is much more impressive than his reactions. I’ll show the scans tommorow when I get the time. Yeah I get what you're saying, but Logan does have better reactions feats than just bullet timing, like reacting to lighting and lasers. For now I think that for a mid-street leveler his combat speed is average. Being "fast" is also a vague term. There's also "subcategories" like travel speed and reaction speed (to fast moving objects/people). Reflexively, Slade has always been stellar for his tier. He definitely has the high-ends to compare but Spider-Man proves to be a bit faster consistently, even though he's working with precog most of the time. Make of them what you will. Unfortunately, I don't really have time to participate in this debate at the moment. @blackspidey2099:Did you get rid of his FTL travel speed feat? @xlr87t3: Batman does not have better reaction feats than Wolverine, I am 100% certain of that. Anyways, scaling like that is such terrible logic. 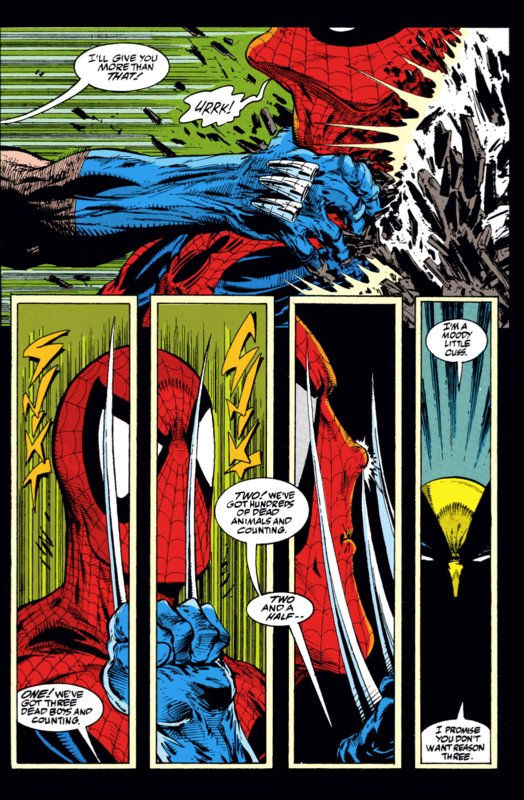 Wolverine has out-sped Spider-Man on occasions but Peter is still faster. Gets out of this cop's peripheral vision without him even blinking. @kevd4wg: You mean Spider-Man outpacing Captain Mar-Vell's greatest speed? It's still somewhere in the RT, but I don't ever use it or give it to people asking me for feats lol... Just like I don't give people Spider-Man one-shotting Hulk when people ask for Spider-Man strength feats. Didn't Deathstroke trip and stab the falsh? @krleavenger: Which writers have said this and where? @gaoron: That's definitely an impressive feat, but it isn't canon since it isn't 616 Spider-Man in that scan. 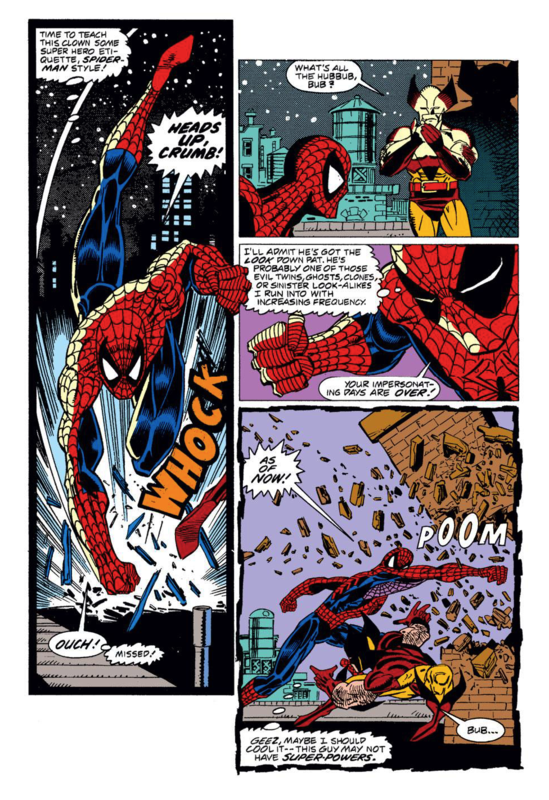 That feat is from Marvel Adventures: Spider-Man, an alternate universe Spider-Man book which was aimed at children and featured a teenage Spider-Man, not unlike Bendis' Ultimate Spider-Man. I like Deathstroke way more. And I've always been a believer that Deathstroke could give Spiderman a really good fight and could very conceivably win. So, yes, I think he's about even speed wise. Batman is faster than Wolverine, and Deathstroke is either faster or (when weakened to normal human levels) equal to Batman. 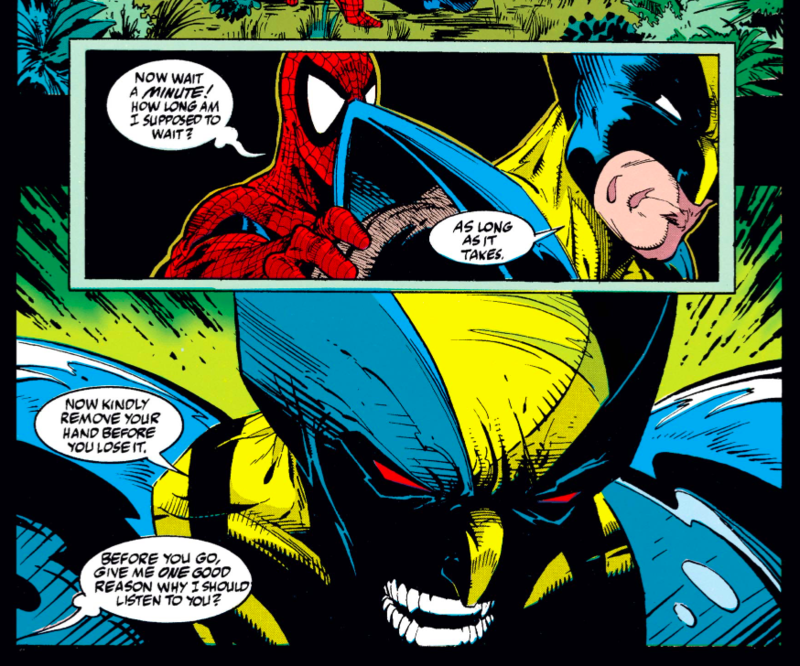 This is wrong, Wolverine is faster than Batman by both statements (being enhanced/superhuman) and feats. 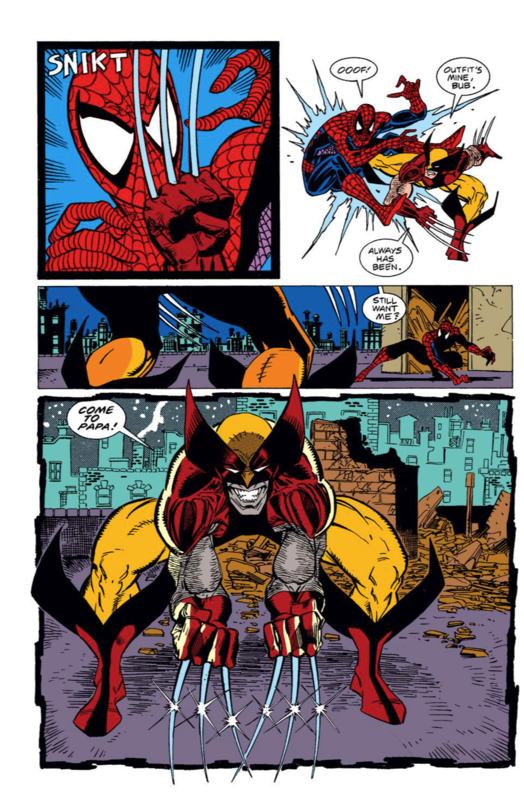 Wolvie outspeeding Spider-Man, someone who consistently makes him look like a slug, is an outlier that doesn't count; that would be scaling backwards. Deathstroke speedblitzes Batman, so he scales above the Bat. I'd stop now before you embarrass yourself. They are bullets being fired from machine guns. It only looks like energy to show the trajectory. I know what you mean but those are called bullet-lines, they're in a lot of bullet timing showings and they're much smaller/thinner than that, in this case they look like balls of energy once they tagged that metal plate in the last panel, dispersing into energy somewhat. Bullets don't do that. Depicting the trajectory I can get, that I don't. Moreover, I sincerely doubt AIM Guards would be using machine guns, it's actually been somewhat implied in the Avengers Vol. 1 #87 that their guns are blasters. We see Black Panther dodging what seems to be a bullet like in your Wolverine scan, but it's later stated to be a "medium frequency" stun blast/burst. I really don't think they would be using standard high calibre machine guns, they're very obviously machine guns mate and this is supported by on-panel in universe evidence. Calculating the trajectory of bullets that are in mid-air and angling a panel is still bullet timing. That's not what I meant, you're misunderstanding me. Basically what I'm saying is what happens in a lot of aim-dodging showings, he's looking at the position of the shooter and placement of the gun, then caluculating the trajectory of where the bullet is going through/based on that, and finally evading right before it's clicked and fired. 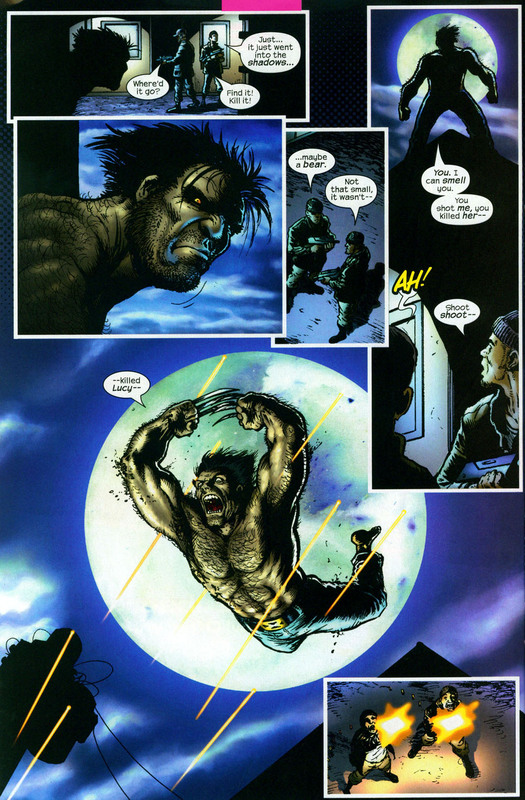 And/or using his super-senses to detect the bullets/gun, which can assist with that as well. I don't see anything proving they were mid-air....it's not clear-cut. I mean Bruce has a lot of feats like that such as deflecting gunfire with a chain or evading dozens of bullets but it's not clear-cut. Some shots might have missed, others clearly aim-dodged. Alright. Here are the showings I was referring to, punching a machine gun shot, hearing the thick bounce of air produced by a surprise sniper bullet (stated on-panel to be 1200 m/s or mach 3.5) then dodging it without looking and throwing a few batarangs as it tags Freeze, and weaving around high calibre machine gunfire (he states himself that he's dodging the bullets). Lightning is in the mach 200 ranges and lasers are lightspeed......I'm not taking those showings seriously and I hope you don't either. Batman isn't Mach 3.5 in any capacity. I would tag CiB but I don't wanna get yelled at for being a Batman lowballer so early in the morning. LOL He's not. Not at all. The distance between him and the shooter is pretty reasonable. I dunno why people act like he dodged it point blank. YOU DIRTY FKING BATMAN LOWBALLER, GO BURN IN HELL, BATMAN HAS MACH 3.5++ COMBAT, REACTION AND TRAVEL SPEED, ANYTHING ELSE IS DIRTY LOWBALL! Even though you said you don't have time to debate this, I'm replying because I think you misunderstood my question. See, the feats you posted are travel/reaction speed. If we consider bullet timing to be proof of supersonic combat speed, Daredevil and Cassandra Cain are casually supersonic in combat. 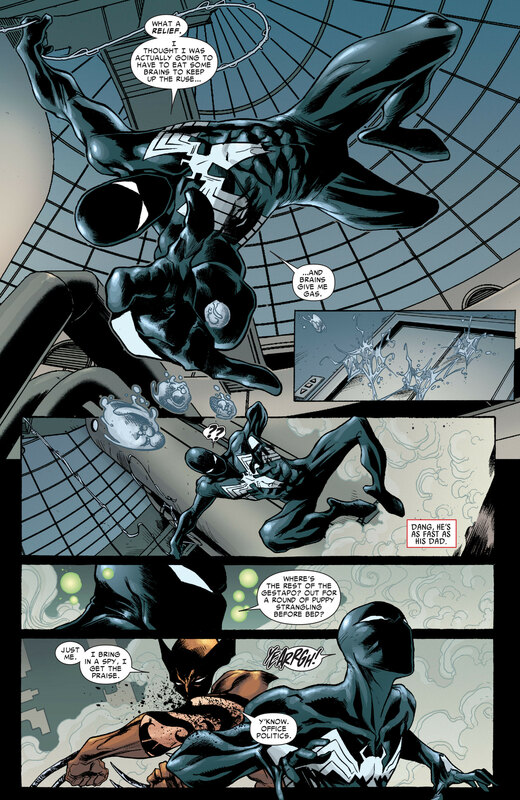 Lanternbatman is claiming Spider-man is constantly supersonic in combat, which means when fighting opponents, Peter is always moving faster than sound himself. That's ridiculous. Reacting to objects/people that fast is one thing, fighting at those speeds yourself is quite another. @fetts: They didn't outright say it as they explained it either with context they established in the issue itself or just had speedsters themselves bring up the fact that Mach 1 is something they rarely do or even after facing a thread that could kill him and people he knows, they still needed a very good reason to go that fast. It depends on what example you are looking into but mostly the issues were written either by Grant Morrison, Mark Waid or Ron Marz (and probably some other writers too). @in-sidiousvader No, he either made the Flash trip or he stabbed him. Not both at once. The former (trip) was Wally West who not only didn't have any connection to the Speed Force, but had his speed limited due to psychic blocks he had at the time due to his fears, and his speed was limited to Speed of Sound. 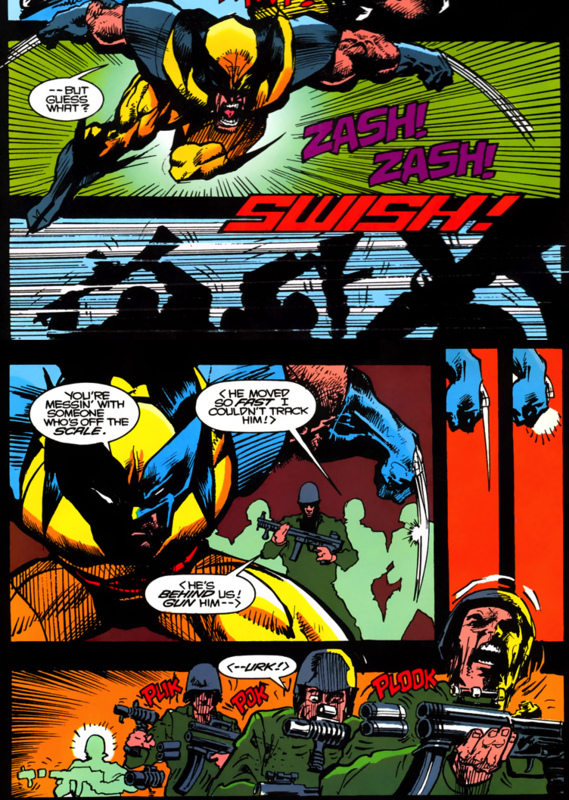 The latter (stab) happened during Identity Crisis where Slade didn't even tag or react to Wally. He took a moment of Flash being distracted by bombs around and then Wally literally ran into his sword. It has nothing to do with Slade's speed but Wally being distracted and being unable to stop himself from moving. Not to mention that in the same arc, Slade did things he shouldn't be capable of doing, like casually one-shotting Elongated Man or overpowering Kyle Rayner with his bare hands. Ahh. I haven't seen the context, I used to read deathstroke and that IC arc was my favorite of his appearances I mean breaking green Lanterns hand and oneshotting Zatanna awesome. Thank you for your explanation, DS is a little ridiculous depending on whose writing him.